We are committed to maintaining our beautiful historic buildings and sensitively enhancing them so that they remain open for anyone who wishes to enter any time of the day. We offer rituals of meaning that hold a space for thanksgiving, celebration and mourning and are very pleased to try and ensure that these baptisms, blessings, weddings and funerals are personal and relevant. We like to work with parishioners to help them craft these ceremonies so that they are contemporary and meaningful. We prioritize pastoral care and being agents of compassion in our communities. We understand our role in the community as one of Serving and Blessing. We appreciate that we are just temporary stewards of these holy places and respect the traditions of the historic church. We offer services on a Sunday from the Common Worship book and many of them are sung communions. Our clergy and choir are robed for these services and our tradition here is middle Anglican. In addition to our Sunday services we have week day communions that are quiet and more informal and a Thursday evening contemplative prayer service that draws on the ancient monastic traditions of silent meditation and contemporary understandings of the mind and human thriving. We understand our worship as one of enriching the lives of people so they can live life in all is fullness. We are passionate about being relevant to present day society and to developing new ways in which the teaching and life of Jesus can be visualized in an increasingly secular society. We understand that much of the language, theology and imagery of the historic church now has little resonance with contemporary society and the culture of younger generations. We are moving forward with progressive theology and looking at ways in which science, philosophy, psychology and politics impact the historic beliefs of the church. We are open and inclusive, and see God as manifest in all things, present and active. We ore comfortable with interfaith dialogue and respect other faith traditions and believe in working with all people of good faith towards a world infused with peace and love. We ore committed to working for a society of justice and especially for environmental healing worldwide and on our Island. We understand our Faith as developing and moving forward into exciting new expressions of belief centred on the Life and teachings of Jesus and God present in all creation. If anything in the above sparks your interest do come and see what we are up to or contact me for a chat anytime. 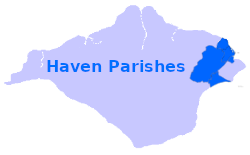 A big "Thank You" to everyone who sponsored the Haven Benefice team of three to undertake the Mean Bean Challenge of eating nothing but rice and beans for five days during Lent to help people who face a daily battle against hunger and poverty. As a result we raised over £750 for Tearfund. I recently went to a morning's workshop in a church building and found we had been locked in. When I queried this I was informed it was to keep us safe "as people sometimes wandered in from the street to use the toilets". Sometime later I learnt that this same church only allows church groups to use its facilities; and locks its doors to the general public, except during services. I felt incensed and provoked to write this article and revisit my own attitudes to church buildings. I was brought up to believe that church buildings were God's House and therefore needed to be treated as such - kept spotlessly clean, tidy, and silent when in use. And when not in use to be locked away from anyone who might perchance wander in, and not give the building the respect it deserved. So ingrained was this teaching that I carried it with me into adulthood, albeit subconsciously. During a recent discussion with a group using the church I am ashamed to say that I heard myself say — "No, I have not unlocked the inner doors to the toilet but access can be gained from the outside". This article is the result of my shame and need to revisit this view. St Peter's is the Parish church of Seaview, and therefore belongs to the Parish. But what does this really mean? I have come to understand that every member of the Parish is a church member and therefore has right of access to the building — not only on a Sunday but at all times, - by appointment and arrangement for weddings, baptisms and funerals, and by spontaneous desire, when Parishioners feel the need to sit in the peace and quiet of the church or it's gardens. That is why as a worshipping community we aim to maintain it to the highest possible standard, and keep the gardens well cared for - for the benefit and enjoyment of everyone in the Parish and elsewhere. But, of course ownership brings responsibility and we are grateful to those in the community who help us with cleaning the church, looking after the garden, providing and arranging the flowers and locking and unlocking the doors, delivering the Parish Magazines and financial support through coffee mornings and donations. Some years ago I visited an abbey in France. It was a hot day and in the cool of the courtyard I found a jug of ice-cold water and a plate of home made cookies. Next to them was a sign welcoming visitors and offering hospitality in Christs' name. Yes, the church is God's house and as such should be a living example of Christ's love for all. We hope that is true of St Peter's and that you will find us a living, loving community of which you are a part. And by the way please feel free to use our toilets! There is so much more to spirituality and a life of faith than just Sunday mornings! There are books to read and practices of prayer to learn and lifestyle choices to be debated and shared. A healthy spiritual life helps to support us mentally and physically and gives life meaning but it also takes a bit of time and space to help it grow. 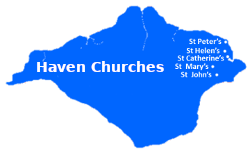 The churches of the Haven Benefice offer lots of opportunities for people to come together in free activities that anyone is very welcome to come and be part of. They are listed in our new leaflet available in the churches and summarised for you here. Why not have a new beginning this year? The Book Group Meeting at 7pm on the first Monday of every month in the Undercroft of St Peter's Church, Seaview and 10.45am in the church hall, Brading on the first Wednesday of the month. The book group is designed as a drop in discussion of the book of the month. The chosen book will be advertised by email, on the web site and in the pew sheets. If you fancy having a look at the book just let Ali know and come along to the discussion. Film Club Meeting at 7pm once a quarter at times and venues to be advertised. The chosen film will be advertised by email, on the web site and in the pew sheets. After the film there will be a discussion and refreshments for those who wish to stay. Prayer Group at Brading On the Second Monday of the Month, 7pm in St Mary's church or the hall. A prayer group meeting to share the concerns of the world near and far. Lay led on rotation, this is a gentle time of refreshment and fellowship. Open to all, just pop in. Bible Study Seaview A friendly and informal look at the readings for the coming Sunday held in Seaview at 10.30 am on Monday mornings. Contact Sylvia for more details on 612600. Contemplative Prayer Thursdays at 6pm in St Catherine's Chapel, St Helens. Using the ancient monastic practices of contemplation, this time of silent prayer for 30 minutes with time for sharing over coffee after, is designed for those seeking to learn more about how to pray silently. 'Living the Questions' Theology Evening Meeting at 7pm on the Third Monday of every month in the Undercroft of St Peter's Church, Seaview. With video material and with lots of space for discussion and questioning, this is the gathering for you if you would like to expand and deepen your horizons but it is also accessible and light. Eco Church and Creation Spirituality The last Sunday of the Month at St Helen's Church 3.30-5.30pm Nature study, Crafts, Shared Meal and Thanksgiving. All ages welcome and especially designed for families Please text Ali (07500 007437) if you would like to be part of this so we know for food. As I write this in November, we are approaching Remembrance Sunday and thinking about the 100th anniversary of the end of WW1. I'm sure you have heard the story of Christmas 1914, where a general truce was not officially called, but soldiers on both sides along the front line left their trenches to cross No-Mans Land; to offer one another friendship on Christmas Day. This act of humanity shows there is so much more to Christmas than just presents, food and parties. It is a time when we look for the best in each other and celebrate common humanity together. It is more than just a winter festival and a holiday, because Christmas remembers the birth of the man who gave to the world these stunning words of peace: 'Love your enemy and do good to those who hate you" . These words echo through the centuries, calling on all of us to be the best that we can be, and leading us to forgiveness and new peaceful beginnings this Christmas time. So this Christmas and always in your churches all are welcome. Whether you are a frequent church goer or not, join us here to celebrate humanity, community and peace.